So biggest boy and hubby have gone on a cub scout sleepover....where does that leave me......? Ohhhhh I think I could cope with that to !! Enjoy your evening, looks like a wonderful one and what a lovely way to start mid term holidays..its here !! No alarm clock for a week lol. Sounds like you have got a fab time ahead! Ooooh you are living the dream! That looks like a perfect evening. Only two things to add - your pj's and a glass of wine (I can't have any so I like to live through others!). Oh and your pup too for extra cosiness! 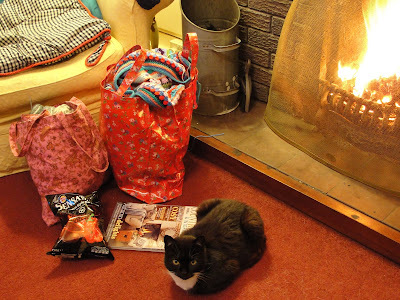 Kitty looks set for a snug evening too. Oh wow, peace and quiet time all to yourself! Oh, what a perfect evening! I wish I could share it with you. I was going to have a fire tonight too but I spent so much time getting everything in because of the first frost that I'm too tired now...LOL! I guess I'll just get my jammies on and curl up in bed with some knitting, a magazine , tea and good book! Great minds think alike! Enjoy! P.S. OH! What's that pretty thing peeking out of the red bag there? Is that something you're working on? I like it....a lot!!! LOL! Nighty night! You go for it girl! I think that's a perfect night in. A cup of hot chocolate and your jammies on.....just lovely!! I bet you are having a lovely time... you will love to see his sweet face upon his return, but for now enjoy. Oh what a wonderful way to spend an evening! Looks like you had everything pretty well sorted for a great night in.